You might recall my post last year in which I expressed how creeped out I was by Facebook's then-fresh "News Feed. " The News Feed basically lets users know what their friends are doing on their Facebook accounts, in real time. 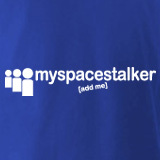 I have since referred to Facebook as STALKERbook." This week, premier social networking incumbent MySpace announced efforts to mimic competitor Facebook's creepiness with "friend updates," which notify users when their friends update profiles, photos and other information. According to a Dow Jones article, "MySpace is the most popular social network in the U.S., with nearly 59 million unique users last month, according to Nielsen Online. Facebook has one-third the number of users, but is growing more quickly and lately has stolen some the spotlight MySpace enjoyed." No doubt, I have maintained both my MySpace and Facebook accounts out of neccesity. Online social networks fall just behind cell phones in the line of most utilized communication tools. My friend and drummer Danny (aka Crazy Man of '07) told me the other day he uses MySpace messages more than email now. I remember the good old days of social networking, B.C. (before creepiness). In the B.C. days, you could update your profile or photos and not worry people instantly knowing what you've done. You didn't have to think about people going online just to quench voyeristic tendencies. Ignorance was bliss. And what happened to plain, old-fashioned stalking? I almost miss the novelty paranoia that people were spying on me by climbing trees or sitting in cars outside my apartment. Now all a stalker has to do is log-in. How anti-climatic. If this blog and Facebook weren't enough, now you all have yet another tools to track me, and each other, in a continually transparent and accessible world. Congratulations. The terrorists are winning. Personal lives will still happen behind closed doors. Just consider those to be screen doors from here on out.